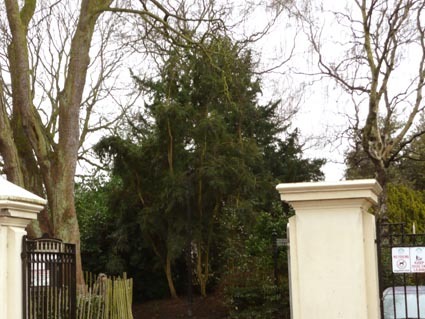 This series of short articles about trees in the Belfast Botanic Gardens is compiled by members of the Friends group and Gardens staff. We aim to build up to a comprehensive archive of trees in Belfast Botanic Gardens. Each article illustrates a tree growing in Belfast Botanic Gardens together with information from a range of sources. Where possible we will give the tree tag number - these are the small aluminium discs, usually fixed on the tree trunk, 2 to 3m above ground level. 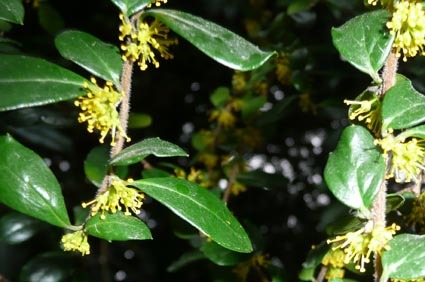 Azara is a member of the family Flacourtiaceae, a fascinating family of mostly tropical and sub-tropical trees and shrubs little known in gardens of the UK apart from a few individuals such as Azara spp and the lovely climber Berberidopsis corallina. There are around 10 species of Azara, native to S. America (Chile and Argentina); most are suitable for milder parts of Ireland and the UK. 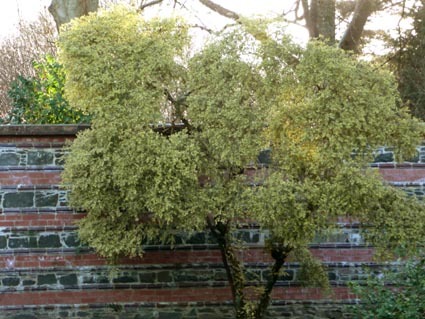 Usually a shrub or elegant small tree, this specimen is slender and has adopted a multo-stemmed tree form. 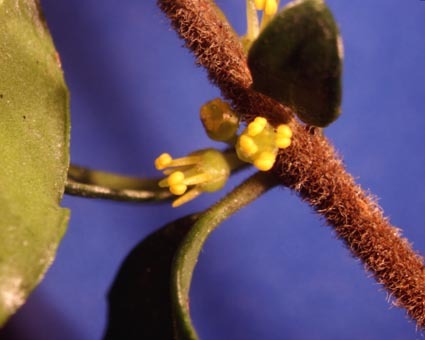 Azara microphylla is an evergreen somewhat resembling Lonicera nitida with its small neat leaves. These are pleasantly glossy and arranged alternately along the stem in two opposite rows. Smaller, about one third the leaf size, foliose (leaf-like) stipules are attached at most nodes giving the appearance of leaves borne in unequal pairs. 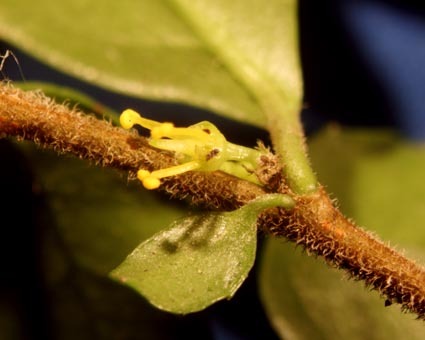 The yellow flowers are very small, often going unnoticed, but distinguished for their vanilla fragrance so early in the year, February to April, when they open. 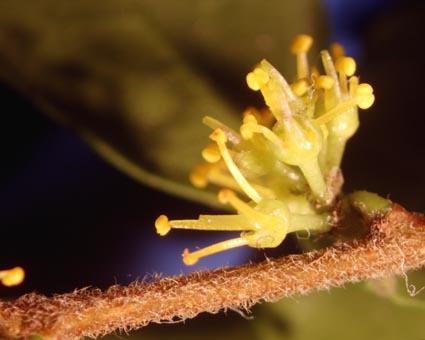 It is the cluster of stamens that is the most obvious characteristic of the flowers which appear on the underside of the twigs, so it is worth getting up close and searching for them. The scent spills out into the air. A variety A. microphylla ‘Variegata’ of garden origin has leaves edged with an irregular band of creamy yellow and has proved a popular garden shrub or wall plant. Photos taken in Belfast Botanic Gardens in 2009 and 2010. Copyright: Friends of Belfast Botanic Gardens.